Providing you the best range of solar panels with effective & timely delivery. solar panels in-house, ranging from 250Wp to 330Wp. Orb’s state-of-the-art 60 megawatt plant is located at the same site as its head office, in Bangalore. Orb uses the latest production technology from Germany for the highest quality product and excellent productivity. Orb’s solar panels do not have negative tolerance, as is the case with many of our competitors. Orb only produces panels that deliver more than their rated wattage. 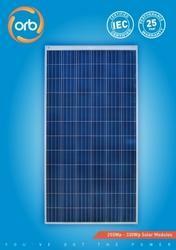 All of Orb’s solar panels are IEC approved and come with 25-year power warranty.